Goshen College’s class of 1953 presented a picnic table to the student body as part of the homecoming celebration this past weekend. Fred Speckeen, class reunion coordinator, spear-headed the fundraising for the project. 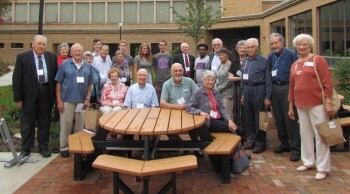 The alumni presented the picnic table, which is located at the entrance to the Leaf Raker, as part of their initiative to see outside study locations for students. A second picnic table was given by the class of 2011. Two umbrellas for the tables will be purchased in the spring. Any extra funds will be designated for the Bill Smoker Scholarship. The class of 1953’s reunion project received a total of $ 2110 from 28 gifts for the purchase of the picnic table and umbrellas. The picnic table was made locally at B & L Woodcrafts in Shipshewana.